Our garment had to incorporate various good draping techniques. Further, all necessary pattern pieces to produce a wearable garment had to be included – such as facings, waistbands, collars and cuffs. Though we didn’t have to sew closures such as buttons and zippers, I took it on as a personal challenge to produce a fully wearable garment. We would be evaluated more on how we could execute the drape, as to the merits of the actual design itself or the quality of the construction. 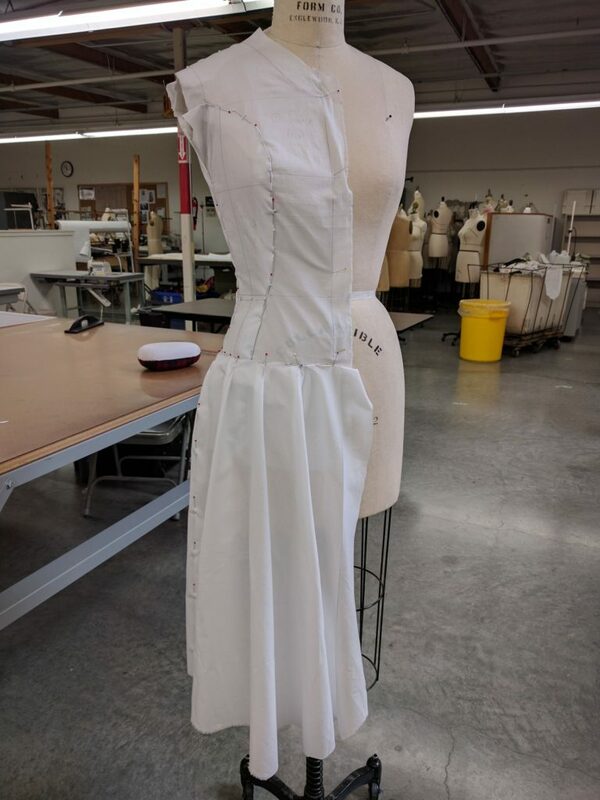 Above all, we would be graded on how well our finished garment fit the dress form. For the fabric, I wanted something that was a departure from previous projects, in terms of texture and color. 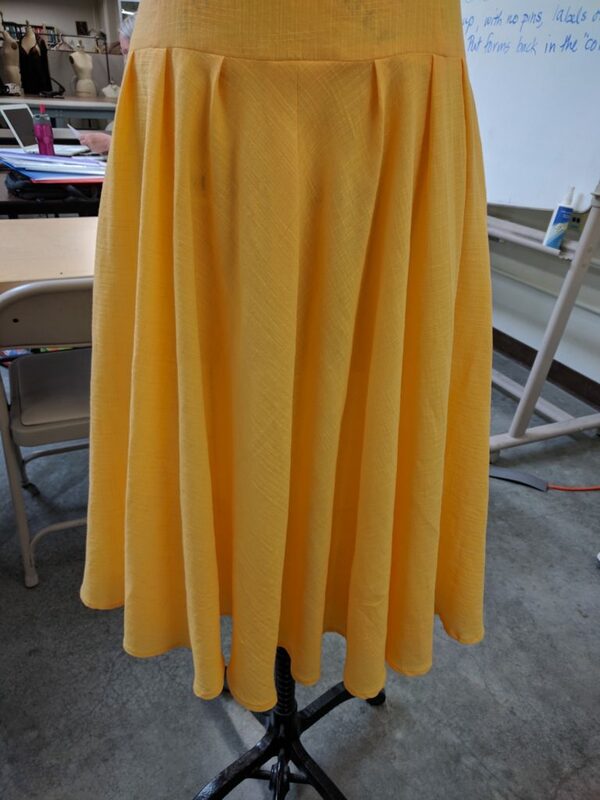 So I went with this lightweight textured yellow cotton. To be safe, I bought 5 yards of the stuff. I think I have enough left over to make myself a summer shirt. I entered the project without a clear vision of a design. 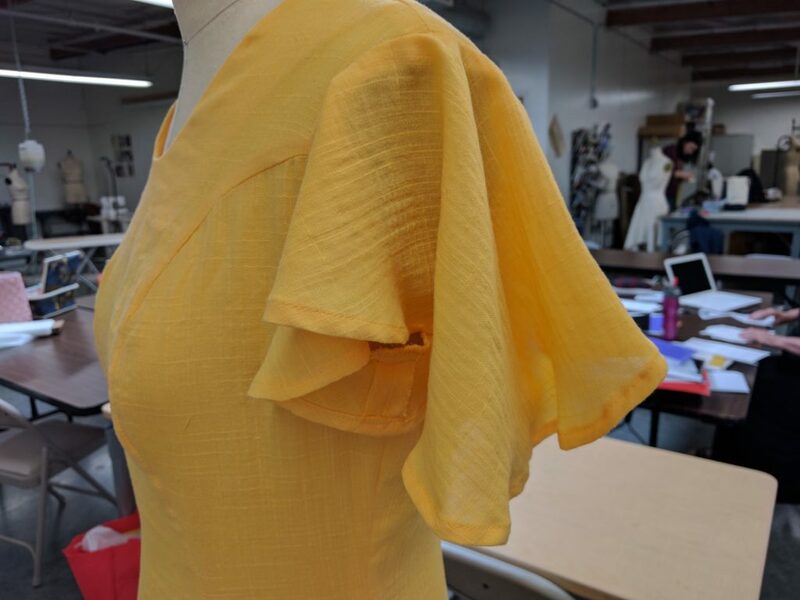 Our draping time on the dress form is largely limited to our class sessions. Sitting in class with time ticking away, I traced a croquis to sketch out a few design concepts. 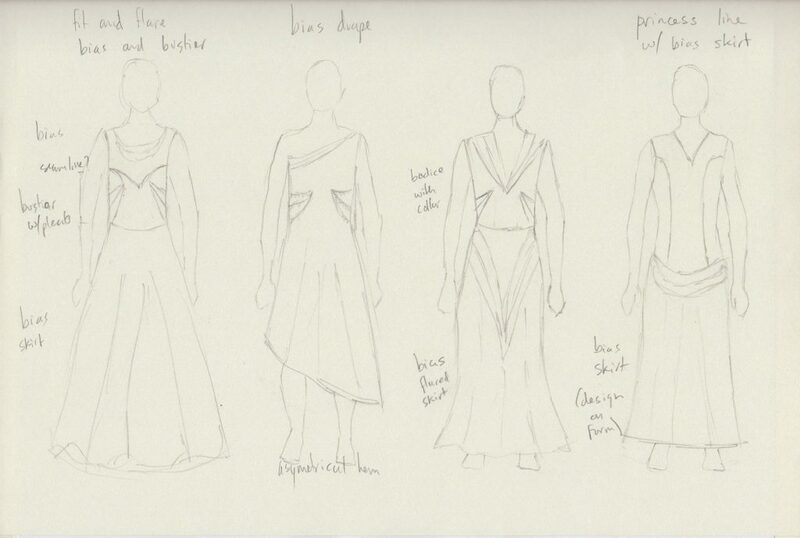 The instructor looked at my concept sketches, and said “You like to make things complicated for yourself, don’t you?” She urged me to choose the simplest design (the princess-line dress on far right) and reminded me the focus was on executing the drape and not the most elaborate design. It was far more important to get the project completed than produce a “Project Runway” showpiece. Ultimately, the instructor offered good advice. I made a workplan of all the steps necessary from sketch to finished presentation, and it was a lot of work for the time I had available. My dress consisted of a bodice and a skirt, both draped with different techniques. The top is a princess-seamed bodice. I played a bit with the princess lines, making them a little extra stylized because I wanted to play with them, especially in the back. One thing I did was to lower the waistline to the high hip. The bodice also has a jewel collar. Here are the style lines for the bodice as I placed them on the dress form. The topmost lines in front and back are the neckline. The lowered waistline line at high hip is where the bodice joins to the skirt. I draped the whole torso down to the low hip (the twill tape line), to give me flexibility if I needed it later in the design process. The bottom of the dress is be a bias-cut skirt. Since I had never worked with bias before in all my experience with menswear, I wanted to learn more about sewing on the bias. I experimented on the form and arrived at a skirt with pleats to create flares front and back. The fabric choice and the overall design pointed towards a summer sundress. Given that direction, I opted for a middle-of-the-road skirt length, appropriate for a casual dress. Our sewn dress was required to have completely finished necklines, armholes and hems. We could decide how we wanted to achieve that. Again, following the sundress idea as inspiration, I aimed for some flouncy ruffle sleeves. More on this later. 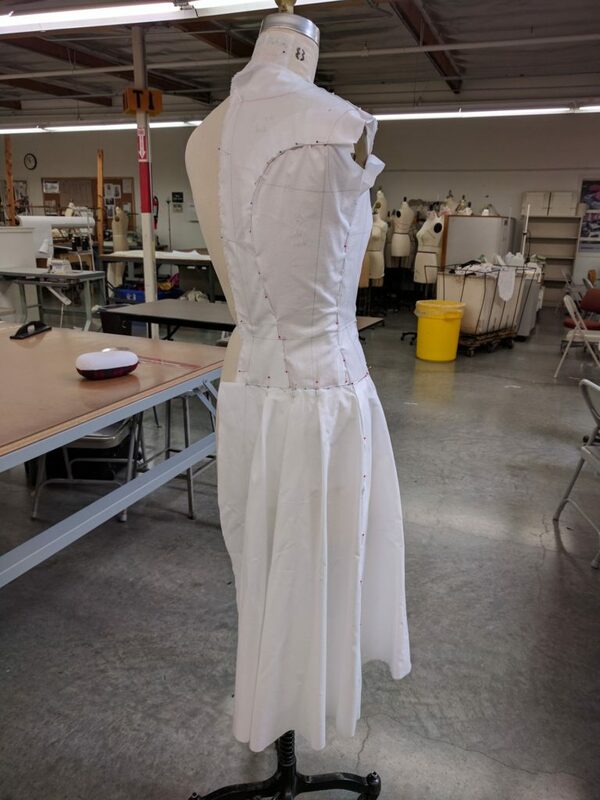 Here’s how my muslin looked on the dressform right after step 5, having trued the pieces and pinned them back together. The back view has been pinned out carefully to mask a problem: the princess lines in back did not match. 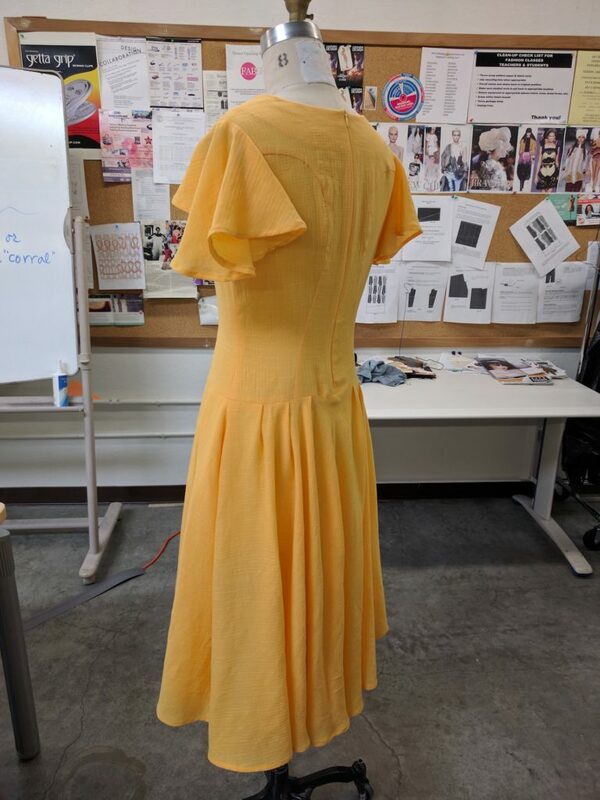 Here is what it looked like on my first test, done with my home dress form which is similar in size to the classroom form. The side back piece is longer than the center back piece along the princess seam. The cause of the mismatch came from a “pinch of ease” I put in the shoulder blades. 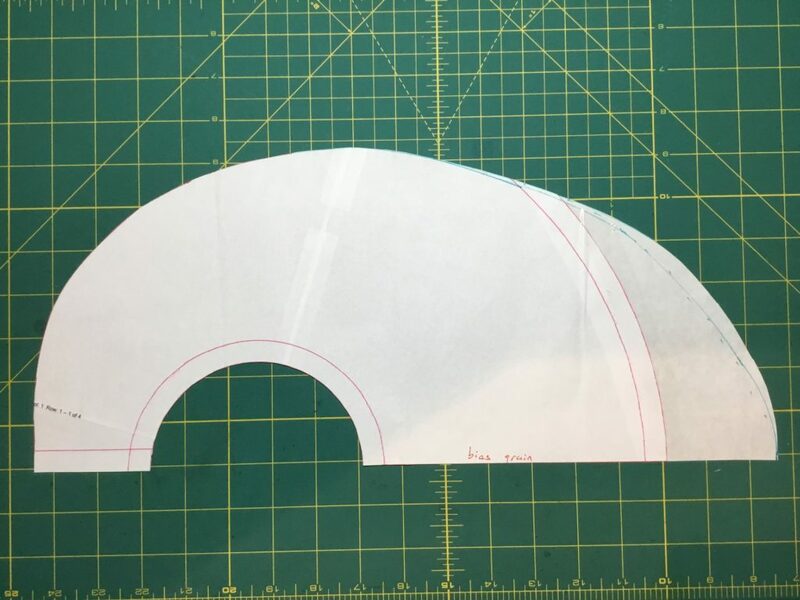 The extreme curve of the princess seam is a circle, and pinching the fabric effectively increased the diameter of the seamline along the circle. This caused the seam line to lengthen by a factor of 3 compared to the ease I added in this area. With our classroom time for draping done at this point, I went back to the classroom outside of class to resolve the issue on the classroom form. Another patternmaking class was in session. The instructor of that class was Paul Gallo, who I’ve taken classes from before. He graciously agreed to review the drape and gave me some advice to resolve the issue – mainly that the two seams should be mathematically the same length. Ultimately I solved the problem by trimming the back side piece at the armhole, in order to shorten the princess seam and make both pieces the same length. Overall, I was pleased by the way the dress turned out. Let’s do a spin around it. The princess lines were easier to deal with than I expected. I was worried about how I would finish the seam allowances, since the curves are so tight I expected to have to clip them in order to get them to fall correctly. Following some advice I got at the Sips N Sews studio, I serged the princess lines. 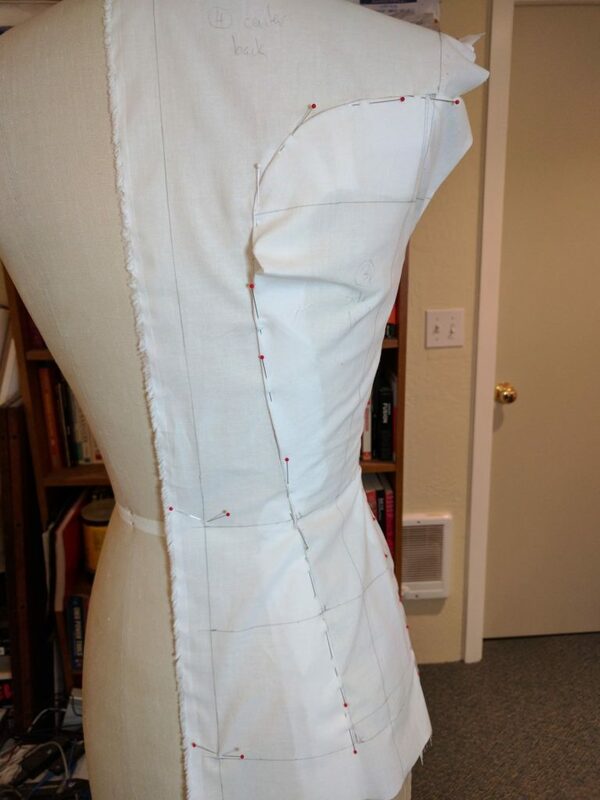 This finished the seams, and the seam allowance was narrow enough to allow the curves to fall properly. For the closure, I went with an invisible zipper in back. Normally the zipper should run to the hip line in order to allow the wearer to get in and out of the dress. I cheated a bit and ran my ziper to the waist seam at the high hip. The bulk of the zipper was inserted by machine, with some hand stitching at the top facing and waist to close. It came out a bit puckery at the waist. 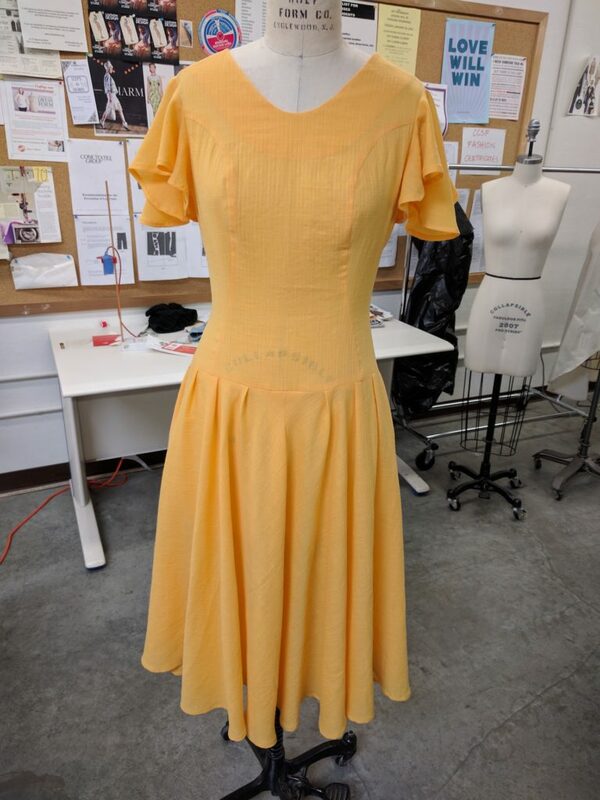 That wasn’t an issue for grading since the emphasis wasn’t on sewing technique, but I would like to go back and fix that before passing this dress off to someone to wear. For the neckline facings, I chose to interface with self-fabric, rather than use a sew-in or fusible interfacing. The fabric is somewhat sheer, and I did not want a white-colored interfacing to show through. I sewed the skirt separately, then joined it to bodice at waist seam. 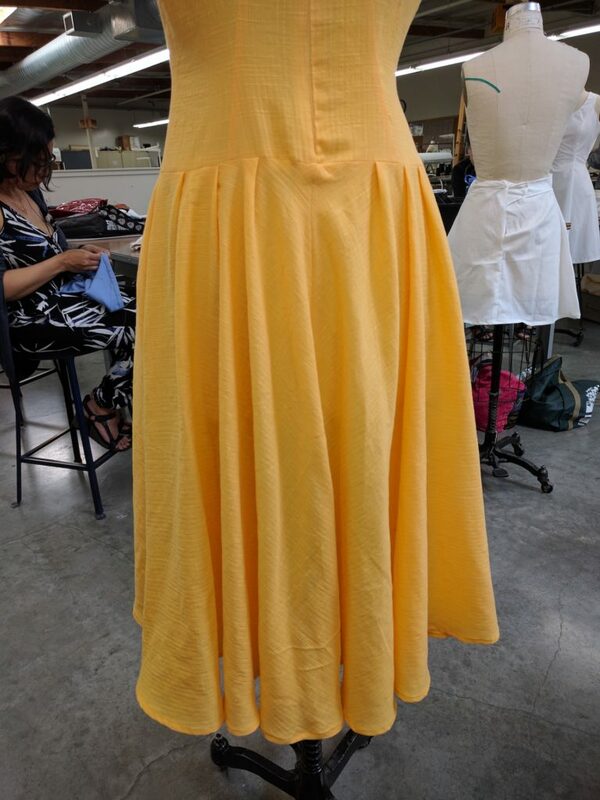 Because the skirt is on bias, it is important to allow the fabric to hang before sewing so the hemline does not droop after the garment is complete. I let the skirt hang on the dress form for two days, but it didn’t stretch out very much. Placing the pattern piece back on the fabric, I trimmed the small amount excess at the hem and moved ahead to sewing. “Bias 101” by Marcy Tilton, Threads, April/May 1998, pg. 34. “Hands-on with Kleibacker: Lessons for working with bias” by David Page Coffin, Threads, Feb/March 2002, pg. 70. 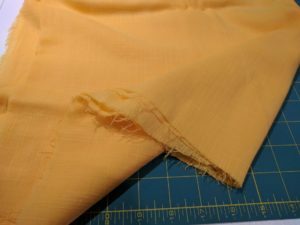 The biggest takeaways from the articles were to use a wider seam allowance – the fibers on cut bias edges relax, so even 5/8 inch away isn’t an accurate stitching line. Also, stretch vertical seams while you sew, with a straight stitch length of 2.5-3. The seam looks rippled after you stitch, but presses out. The hems on skirt and sleeve are simple rolled hems, as on the hem of a dress shirt. I was pushing myself in other areas, so here I went with a technique that is already in my wheelhouse. But even this surprised me; they were time-consuming, and I didn’t always produce a clean result. The ruffle sleeves went in very late in the construction. 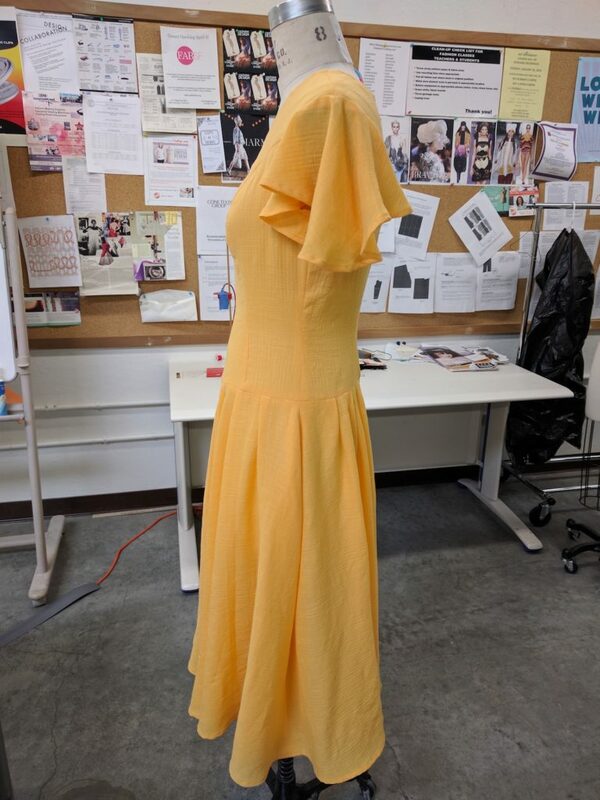 I followed instructions from Paul Gallo’s Craftsy class, Fashion Draping: Bias Design. 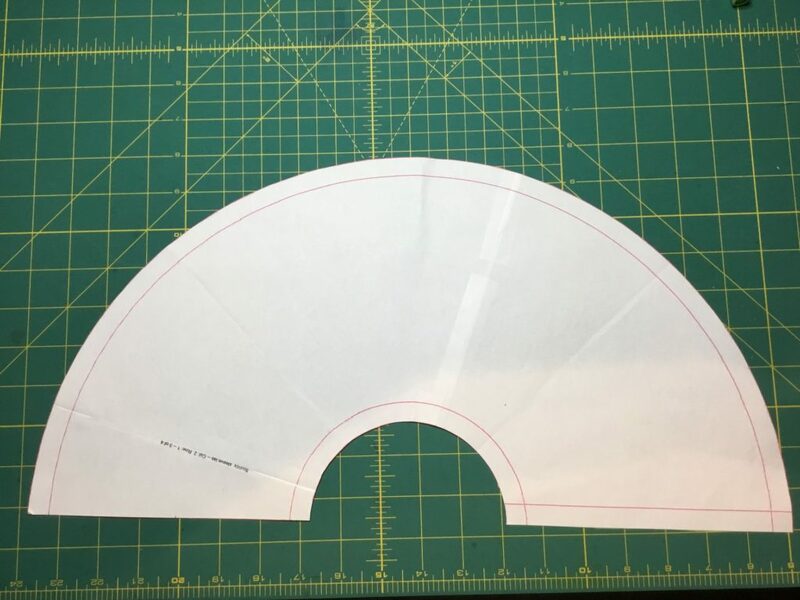 He presents a very simple way to make a flouncy bias sleeve by cutting a donut shape in fabric, with the sleeve hole as the center of the donut. Here’s a half-pattern I made along these lines. Bias lines up with the underarm seam to ensure the outside of the sleeve hangs on bias. I cut this from muslin, placed on the dress hanging on the form and then draped and trimmed it to get a good look. 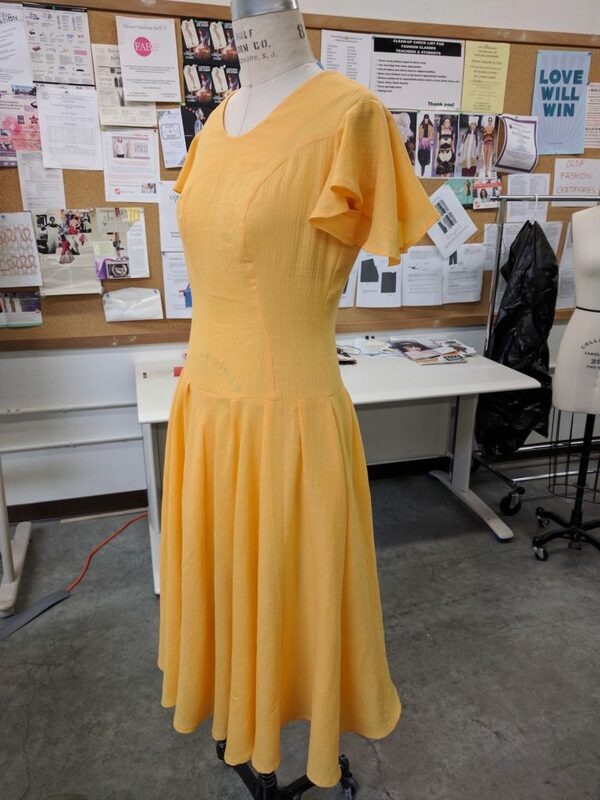 The pattern evolved to an ellipse with an off-center armhole, in order to take out fabric from the underarm area and add more fabric to the upper outside of the sleeve. Here’s a closeup of the result. 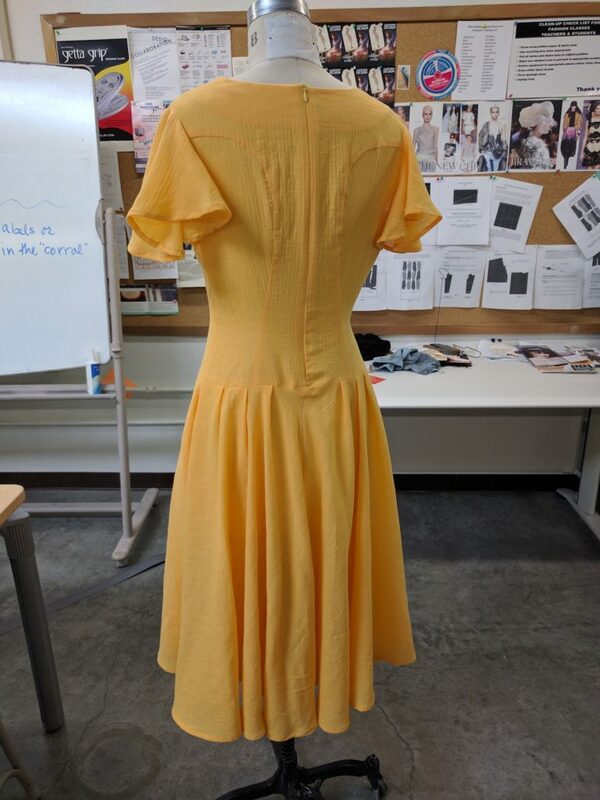 On the final day of class, my dress went into a lineup with the other student projects. Each of us took a few seconds to talk about our work, then we received critical comments from other students as well as the instructor. I’m pleased to report this was a really positive experience for everyone in the class. The zipper is not long enough in the back, causing an ingress/egress issue. Ideally, the zipper should extend 7 inches below the waist. (Something I also anticipated). The pleats in the dress could stand to be wider – the centermost pleats don’t flare downwards enough. This issue could have been caused at the patttern clean-up stage as I made pleats consistently the same size at the paper pattern stage. I might have been better with the pleats as I arranged them on the dress form. On the back, the very strong curve of the princess lines over the shoulder blades wasn’t well received. On the front, the outwards princess line flare towards the side seam was regarded as not so flattering. Running the princess lines more to the center at the waist would have looked better. I didn’t need to add the “pinch of ease” in the shoulder blades that caused my pattern issue. 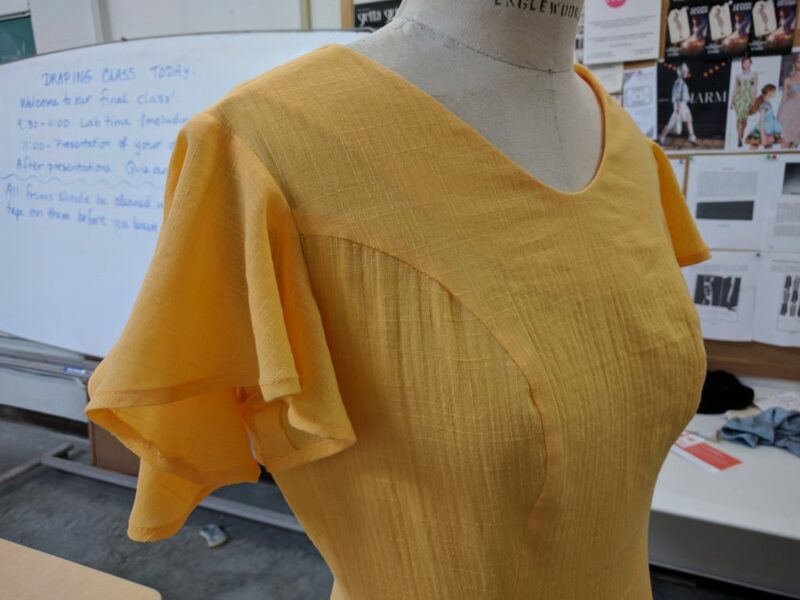 Because the pattern has a flounced sleeve, there is no constriction of movement by the sleeve and so no need to add ease to the body to address it. I got positive feedback for the work on the sleeves and facings. The dress has a nice 1930’s feel to it. I thanked the instructor for what was for me, a thrilling and exciting class. And in case anyone was curious: I got a good grade for the final assignment, as well as the class as a whole. Fashion Illustration – this class is an intensive, meeting three days a week for almost the entire day, with ample homework outside of class. The instructor is Paul Gallo. 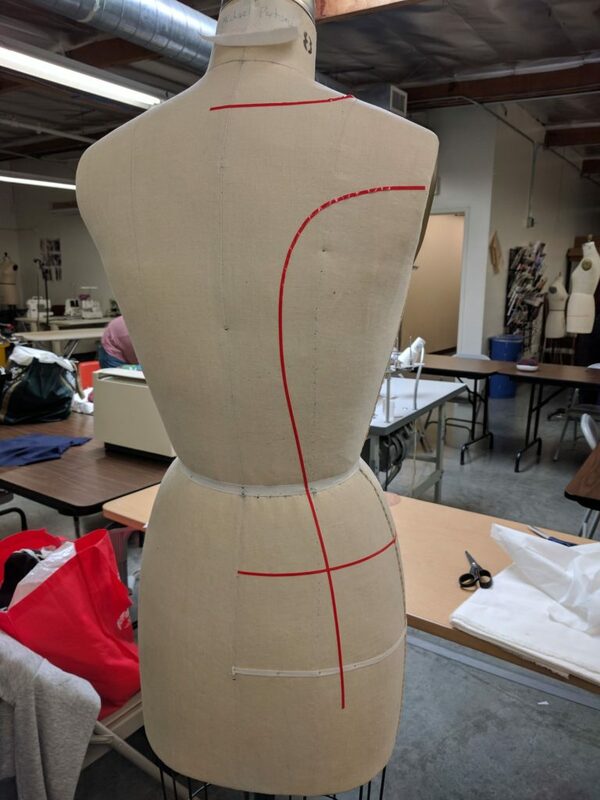 Moulage (drafting a skin-tight torso pattern from measurements) – this class is being taught by Lynda Maynard, using a draft from Kenneth D. King. More on these classes in the future. I will conclude the shirt fitting series. Bias, Paul Gallo, David Page Coffin, and your aforementioned wheelhouse…I swoon. First thing I noticed were your princess seams, quite comely, and well done. The sleeves were an inventive twist. I wanted to have part three done by now. The draft is written, but I need to approach the “client” at the right time to snap some fitting photos. Great work, write-up, and the dress looks really comfortable. When I first saw it, I noticed the front seam lines and thought they gave the dress some flair (as well as flare). 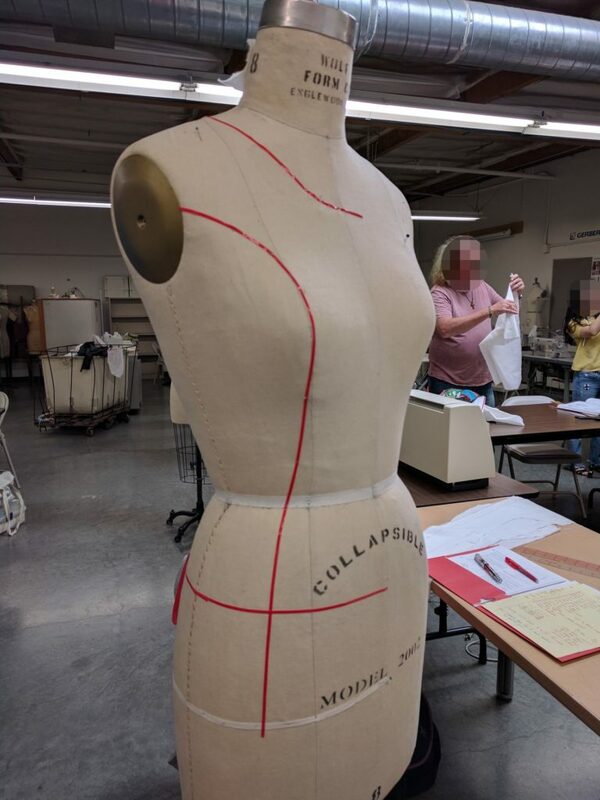 Did the class/instructor think the seam lines accentuate the width of the wearer’s hips? The fabric is beautiful. Great choice. Yes, my intent with the front princess lines was to give the dress some flair. The issue the instructor noted is they flare out towards the sides as they move down past the waist. That basically puts a frame around the tummy and so accentuates whatever is there. All that said, the instructor noted she was nit-picking on this issue, and took very few points off the final score.